From Marine Corps fighter pilot to NASA astronaut, to the global warming debate, Walt Cunningham speaks to Shane Hannon about his adventures. Walter Cunningham possesses that composed, tanned look that epitomises the stereotypical former astronaut. Yet, Cunningham, now 81-years-old, certainly looks younger than any of his biographies say he is. Born in 1932 in the small town of Creston, Iowa; the Houston resident has had quite a life. Known for his honesty, Cunningham’s website is littered with articles he has written on topics such as climate change and the future of American manned space travel. It is certain, if he has something to say, he’ll say it. Having accumulated over 4,500 hours of flying time, including more than 3,400 in jet aircraft, it is safe to say Cunningham was one of the finest pilots of his day. It was because of his piloting and physics background at University of California, Los Angeles, where he earned his Masters in this field, that Cunningham was ultimately chosen as an astronaut by NASA. Selected as one of fourteen members of the third group of NASA astronauts in October 1963, Cunningham’s first crew assignment was as prime lunar module pilot on Apollo 2. However, time issues arose and as Cunningham recalls, “When we got behind schedule they cancelled Apollo 2 and we’d been training on that for seven or eight months. And when they did, they moved us on as backup crew for Apollo 1 because they had the same kind of spacecraft.” But this plan too would eventually be compromised, albeit in an altogether more tragic fashion. January 27th, 1967 is a day which all those associated with the American space enterprise in the 1960s will remember with great sorrow. It was on that day during a routine plugs-out test inside the spacecraft, a month before Apollo 1 was due to launch, that a spark ignited in the command module’s 100% oxygen environment. The ensuing fire resulted in the deaths of the prime crew, Gus Grissom, Ed White and Roger Chaffee, and threw Kennedy’s plans to get Americans to the moon and back by the end of the decade into disarray. In January 1967 there were many problems with the Apollo command module that the astronauts were worried about, and ironically enough the fire can be said to have sped up the process of getting to the moon. Cunningham observes, “[The fire] gave us added strength with the contractor to fix the vehicle. A month after the fire, Cunningham, along with veteran Commander Wally Schirra and fellow rookie Donn Eisele, inherited the Apollo 1 mission. Apollo 2-6 were unmanned test missions, and Cunningham’s flight was therefore re-numbered and designated Apollo 7. After the year and a half delay to allow for the fire investigation, the crew of Apollo 7 launched on a Saturn IB booster on October 11, 1968 and began what would be an eventful 11-day mission in Earth orbit. During the mission, the crew performed various experiments and proved the Apollo Command and Service Module’s flight worthiness, paving the way for the Apollo 8 flight around the moon two months later. The mission wasn’t without its hitches however, with Commander Schirra, one of the original Mercury Seven astronauts and veteran of two previous spaceflights, suffering with a cold and becoming increasingly agitated and irritable towards Mission Control back in Houston. 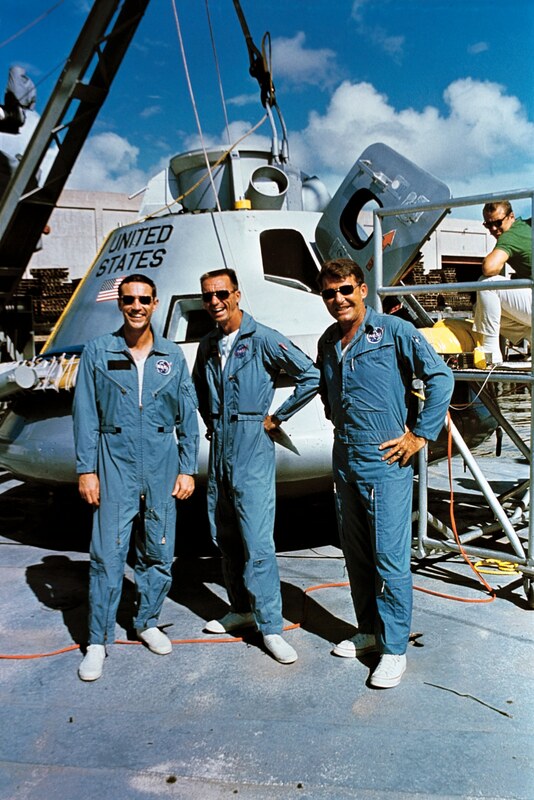 All in all, Apollo 7 was a successful flight, and although it would be the only time both Cunningham and Eisele would fly, the mission achieved its objectives and then some. The 263-hour, 4.5 million mile shakedown flight came to an end with a splashdown in the same Atlantic Ocean Lindbergh had flown solo over forty years previously. A year and a half later, spaceflight veteran and the third man to walk on the Moon, Pete Conrad “decided he wasn’t gonna leave NASA yet and they put him in charge of Skylab. So all of a sudden I was gonna be backup to Pete. That’s about the time I decided to get out.” Cunningham resigned from NASA in 1971. Of course, Cunningham has other interests outside of space travel. His views on global warming are well known, and he has quite a bit to say on the matter. He is a physicist by education, was a founder of The Earth Awareness Foundation in 1970, has been on the board of the National Renewable Energy Laboratory for five years, and has been writing articles on the environment since 2000. He is an advocate against the theory of Anthropogenic Global Warming (AGW); in other words, he is a global warming skeptic. In September of this year, the Intergovernmental Panel on Climate Change (IPCC) released their latest report in which they state there is now a 95% probability that humans are responsible for global warming. Cunningham sums up his opinion by stating that he has “yet to see data supporting the claim that humans are responsible for controlling the world’s temperature.” He even argued his case in person at the 2013 United Nations Climate Change Conference, held in Warsaw in November. When asked about the current administration and where NASA is at today, Cunningham is equally as scathing. He claims, “Obama doesn’t have any interest in it at all, but politicians have to go along with something.” It was Obama who, in 2010, cancelled the Constellation program to take humans back to the Moon by 2019. 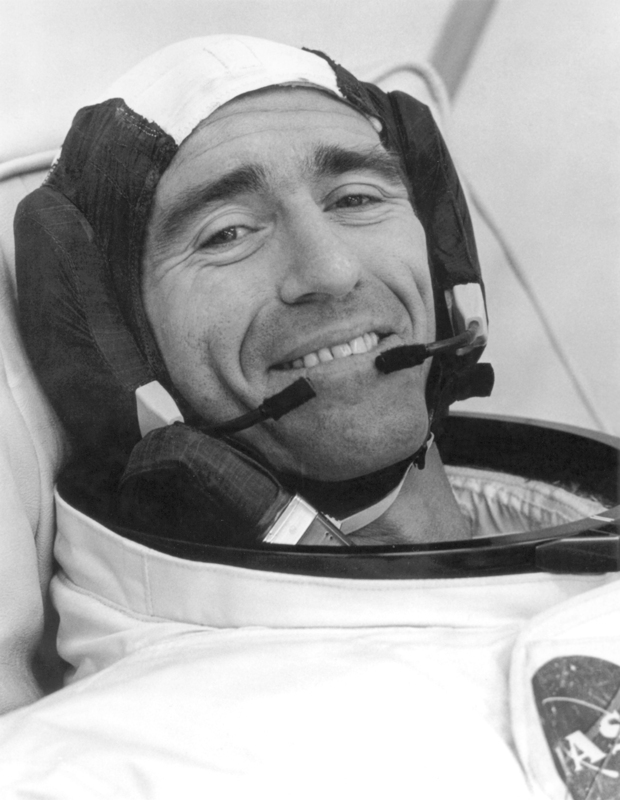 Cunningham is now the only surviving crew-member from Apollo 7; Eisele died of a heart attack in 1987 while ‘The Happy Warrior’, Wally Schirra, passed in 2007. Cunningham celebrated the 45th anniversary of the Apollo 7 launch in October just gone with a cocktail, and a much-deserved one at that. Walter Cunningham: fighter pilot, physicist, astronaut, and above all else, an All-American Boy. 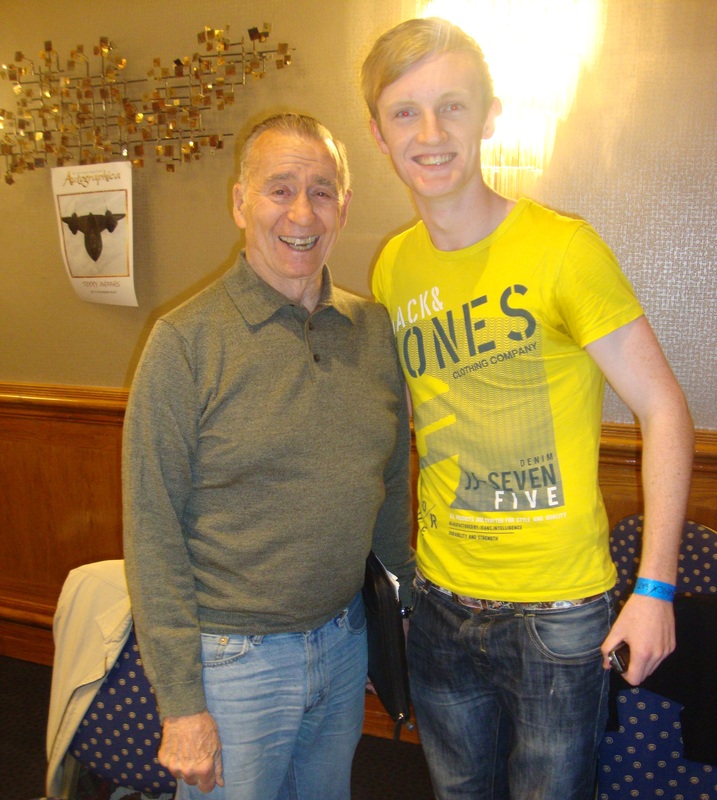 The above interview with Col. Walter Cunningham (Apollo 7) was exclusively conducted during the Autographica event held at the Hilton Metropole Hotel in Birmingham, UK on September 21st, 2013.